When the days get shorter, it’s time to bid farewell to summer ATV sports. As you prepare your ATV for the long wait until spring, look into upgrading your ATV wheel spacers. You want to start next year off fresh! After a full season, your ATV wheel spacers will be showing the signs of wear and tear. The end of summer is the best time to address these flaws. 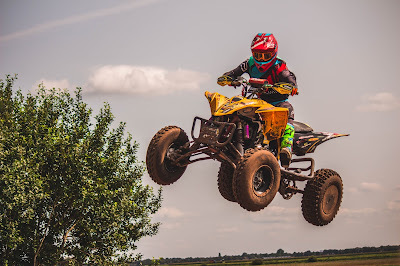 As you’re getting ready to pack your ATV up for the season, take the time to assess its needs. Look for warping and wearing along the spacer. Test to see if every bolt is tight. Reflect on the amount of maintenance you had to do during the season. If you’re not happy with the wear pattern, this is the time to upgrade your ATV wheel spacers. You know how your current pair worked. Can you run with the same model, or do you need something a little tougher? The end of the season is the time to see the cumulative effects of riding hard all summer long. You don’t want to start the season on old ATV wheel spacers. When you break out your ATV at the start of next season, you’re going to want to hit the trail right away. Putting in the time to do a detailed check of your machine is going to require patience that most people don’t want to spend. Just a quick check to make sure nothing happened to it since you put it away, and you’re ready to hit the road! Starting the season with a bad set of spacers is an affront to the true joy of ATV wheel spacers. Your machine won’t be handling at peak performance. You may not even realize it at first, but it absolutely can get better. Set your expectations high by having new, well-fitted ATV wheel spacers installed before you hit the road. ATV wheel spacers are still being improved upon. As you grow more skillful in your handling of the machine, you notice the difference between spacers more. A beginner driver won’t be able to feel the difference between spacers that are okay and spacers that are great. A seasoned driver can make the most of the finest tools. The longer you own your ATV, the more comfortable you become behind the wheel and in the garage. Put your new experience to use at the end of summer by selecting the wheel spacers that are going to serve you well next year. Fresh spacers are the best solution to your ATV’s needs. Getting spacers that can keep up with you is key to enjoying your sport. As you get to be a better driver, you’ll get more out of the fresh new spacers you installed.